The legal slugfest between partners-turned-competitors Apple and Samsung continues: Samsung has demanded that Apple release the iPhone 4S/5 and iPad 3 to their lawyers as part of a discovery process to determine if there was any infringement on Apple's part. This comes days after Apple demanded that Samsung hand over the Droid Charge, Infuse 4G, Galaxy S II, Galaxy Tab 10.1 and Galaxy Tab 8.9 to see whether or not these products should be blocked from the market. What's interesting and, frankly, a little weird about motion is that Apple has little at stake. While Samsung's line is for the most part on the market to be reviewed, Apple is characteristically hush-hush about whether or not the new iPhone and iPad exist, let alone when they will be released. They could very well kill the motion before it can get anywhere. 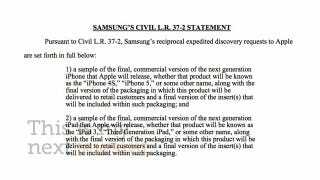 Apple and Samsung held negotiations for a year before giving up and heading to the courts, and I'm reliably informed that there haven't been any substantive settlement discussions since Apple first filed its complaint. That means talks have been at a standstill for a long time now, and I wouldn't be surprised if Samsung was trying to put some additional heat on Apple to try and kick negotiations back into gear.